We’ve all been there: standing in the dark at midnight peering into the glow of the fridge, fighting the urge to snack (and mostly failing) in the middle of the night. And let’s face it… it’s not salad we’re after. We head straight for the chocolate bar, that last slice of cake, or the bag of chips we worked so hard not to open all day. Leftovers reserved for tomorrow’s lunch? That sounds like a problem for future you to deal with. Those with kids have twice the challenge: how do we handle the late-night stomach rumbles of both ourselves and our kids? Why can’t we just go to bed? Why do the pangs of hunger seem to strike when eating is the last thing we should be doing? While going to bed hungry can disrupt our sleep, eating the wrong things can also have this effect. Many of the snacks we tend to gravitate toward late at night are the kind that keep us awake. 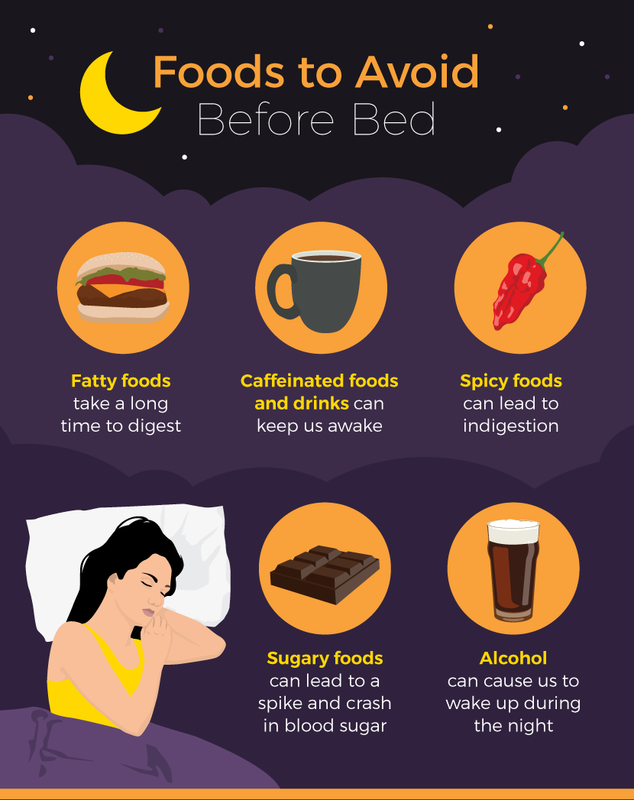 Foods and drinks to be avoided right before bed are those that are fatty, spicy, sugary, caffeinated, or alcoholic. Spicy food can cause indigestion and discomfort, while fatty and oily foods take longer to digest. Sugary foods can make your blood sugar spike and crash, which can lead to waking up in the middle of the night. Caffeine is a more obvious stimulant, but in addition to watching things like coffee intake too close to bed, dark chocolate, green tea, and other foods/drinks also contain caffeine. Alcohol is less intuitive. Many people believe a “night cap” can make us drowsier, but drinking alcohol before sleeping can lead to waking up in the middle of the night. 1. If you do indulge in a late-night snack, try to keep it light and small. Because we don’t immediately feel fuller after we eat something, it can be tempting to keep eating. Keep your snack small and you’ll be able to get a full night’s sleep. 2. 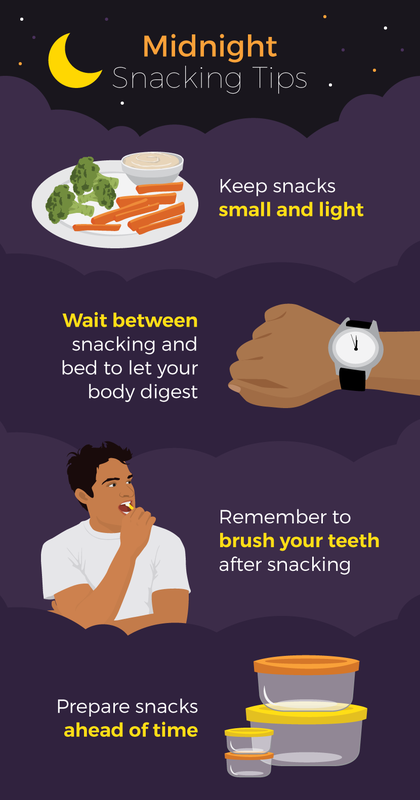 Take some time between your snack and going to bed to give your body enough time to digest so that it’s not working away in a horizontal position while you’re trying to sleep. 3. Make sure you brush your teeth after snacking! 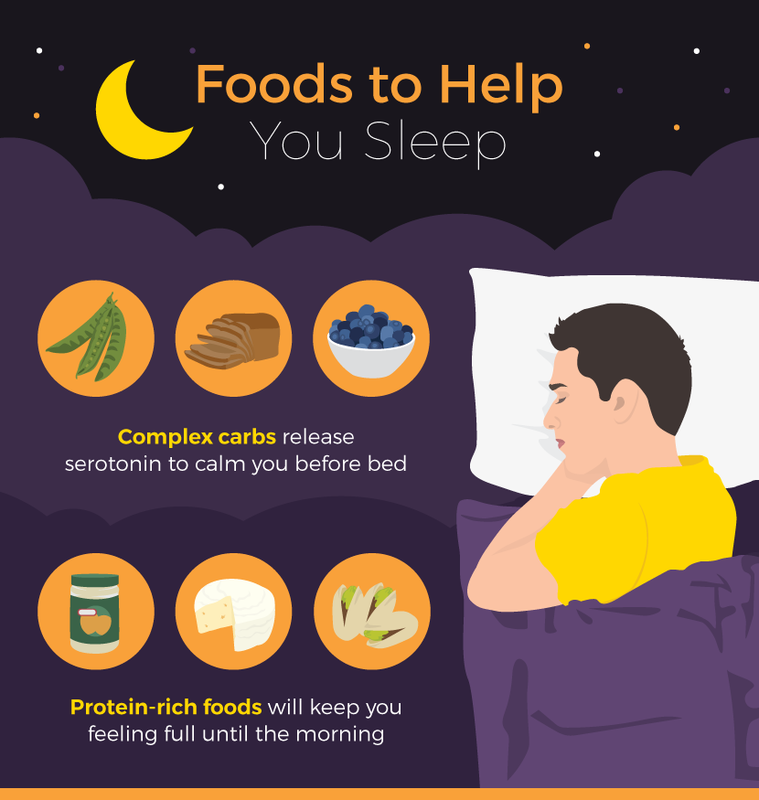 This is easy to forget when you opt for some late-night snacking. The last thing you want are your snacks wreaking havoc on your teeth while you sleep. 4. Prepare the right kind of snacks ahead of time so you don’t feel tempted to tuck into the chocolate when it’s the only quick-grab option. The best advice for the repeat midnight snacker is to try to avoid the practice altogether by eating a varied diet, drinking plenty of water, and sticking to healthy portion sizes. But if you do start feeling hungry late at night, it’s not the end of the world to indulge in a snack to keep you from waking up from hunger mid-sleep. Just be sure to keep it small, leave some time for digestion, and choose foods with complex carbs and a bit of protein.